interested in having the My Trusty skincare range in their stores. In conversation with Sarah Boyle – co-founder of Spring Chicken, we answered the following questions about My Trusty that she knew her customers would ask. Spring Chicken now stock My Trusty in their mail-order catalogue which is circulated to around 30K people. 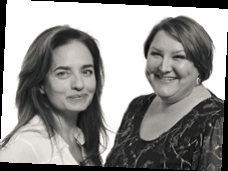 Spring Chicken is an Oxford based group of like-minded people that have built a company that aims to make life easier for everybody, particularly those with health issues which make things more difficult than they were. They scour the world for the newest products, the latest research and the most up-to-date thinking and deliver them through their website to anybody who needs them. They are fanatical about finding well-designed products that look good and work well, and have found these qualities within the My Trusty skincare range. It is unique. My Trusty skincare is wholly owned by this Salisbury NHS Foundation Trust and is the first and only product, branded by an NHS Trust within the UK. The brand name was created by the nurses of the Trust as proven results deemed it a ‘trustworthy sunflower moisturiser’. It has a long NHS proven heritage. The sunflower formula was developed and created in 1992 by NHS clinical specialists specifically to help support the healing and appearance of damaged skin through injury or surgery. It is ethical. All proceeds from the sale of My Trusty are reinvested back into NHS patient care. Q? “Many skincare brands leave skin feeling oily and sticky, are these any different? 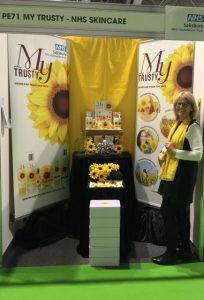 A: My Trusty was clinically developed with a foundational ingredient of high grade natural sunflower oil because it is a rich source of linoleic acid (essential fatty acids), essential for improving the barrier function of the skin cells that prevent moisture loss from the skin, which causes dry itchy skin. Sunflower oil is very light and does not clog the pores, which other oils can do causing a sticky feeling. It is highly absorbent which prevents it from sitting on the surface of the skin making it a non-greasy very hydrating moisturiser. A: My Trusty sunflower hand cream or body lotion (fragrance free) would benefit people with sensitive, dry itchy skin as it is water-based and has 5% natural sunflower oil in the formula. Skin is unique to every individual, and what suits one person, may not suit another. We have clinical evidence that our sunflower cream will hydrate skin for up to 24hrs, which will eliminate the itchy symptoms, and should be liberally applied to clean skin, twice per day. The sunflower body butter is much thicker as it is made from Shea & Cocoa Butter, and has 6.5% sunflower oil. It is naturally fragranced with essential oils of neroli, bergamot & orange. The butter is perfect for really dry skin, such as feet and legs. Feedback from psoriasis sufferers have commented that this is a fantastic alternative to the chemical based creams, and really is softening which helps with the itchy symptoms. A: Used regularly, moisturisation and massage of My Trusty sunflower skincare on the face and body, will most definitely help improve the appearance of scars and blemishes. A: No, the oil is made up of 10% natural sunflower oil, and subtly fragranced with essential oils of neroli, bergamot , rosemary and rosehip. It is perfect for a facial moisturiser, especially under make-up. It has also been clinically proven to help improve the appearance of scars and stretch marks. A: Yes. Sunflower oil is well known for its skincare benefits as it has the highest levels of linoleic acid (essential fatty acids) properties in it, compared with all other oils in the agricultural plant tables. We cannot make linoleic acid in our body, and has to be absorbed from our diet. Despite eating healthily, we cannot measure how much essential fatty acids we are absorbing from foods, to assist the effective functionality of our skin. Therefore, a moisturiser rich in sunflower oil, used as a topical cream or oil, will help hydrate the skin on the outside, keeping it supply and free from any tightness or itchy symptoms. A: Skin is renewing all the time, but as we get older it thins and becomes more brittle. Using a rich sunflower cream or oil regularly will keep the skin supple, preventing it from cracking and drying out. The cream will spread well onto the skin; however the silky, dry oil is wonderful for the face, neck and shoulders. Q? “Several customers are desperately trying to find a suitable moisturiser because they have an underactive thyroid & their skin is very dry and very fine” A: Initially developed for seriously dry skin that had been damaged through burns, the natural sunflower cream is effectively hydrating, easily absorbed, non-greasy and can be used anywhere on the face, body and hands. A: Hyaluronic acid is indeed a good moisturiser – it is also extremely expensive. Anything in the same price range as our products that contain hyaluronic acid will not have enough however of it in the product to have much effect on the skin. Skin moisturisation can come from less expensive actives… My Trusty, with its unique sunflower formula does increase moisturisation through other actives (Sunflower Oil, Glycerine etc). It should be noted that Sunflower Oil is also good for dry skin for other reasons (essential fatty acid replenishment, Vitamin E, F & K) (Martin MacKenzie-Smith MRSC, Technical and Regulatory Manager, Hampshire Cosmetics Ltd).